Sweet. Salty. Sour. Spicy. Nailing these four key flavors is the secret to creating the complex textures and fruitful spiciness traditional Pad Thai is known for. 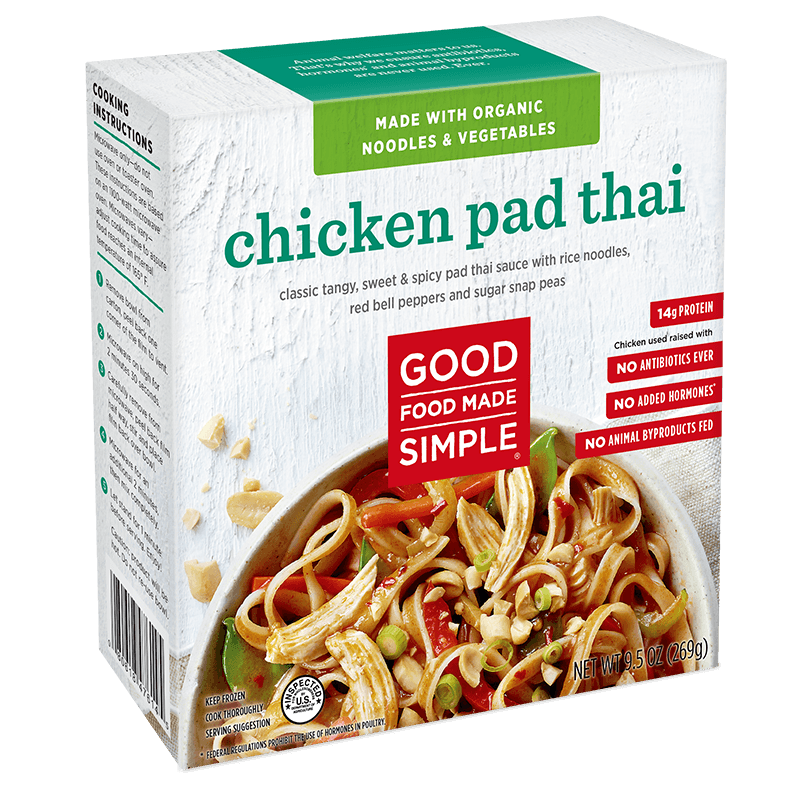 Our tender chicken is combined with organic rice noodles, red bell peppers, sugar snap peas, and our spicy Pad Thai sauce for flavor to noodle on. CARROTS, ORGANIC TAMARI SAUCE [WATER, ORGANIC SOYBEANS, SALT, ORGANIC VINEGAR], ORGANIC GARLIC, RICE VINEGAR, TAMARIND JUICE CONCENTRATE [TAMARIND], CORN STARCH, FISH EXTRACT POWDER [TUNA], ORGANIC CAYENNE PEPPER), COOKED SEASONED CHICKEN (CHICKEN BREAST MEAT WITH RIB MEAT, WATER, LESS THAN 2% POTATO STARCH, SALT, NATURAL FLAVORS, SPICE, LIME OIL), ORGANIC RED BELL PEPPERS, ORGANIC SUGAR SNAP PEAS, ORGANIC PEANUT. CONTAINS: TUNA, PEANUT AND SOY.